The new policy resulted from passage of a resolution introduced at AFT’s 2014 National Convention by Barbara Bowen, AFT Executive Board Member and President of the Professional Staff Congress/CUNY (PSC CUNY represents more than 25,000 faculty and staff at the City University of New York (CUNY) and the CUNY Research Foundation). Young children in sugar cane field in El Salvador. “You can always count on the American Federation of Teachers to stand up for children, labor and human rights,” commented Ray Rogers noted organizer, human rights advocate and director of Corporate Campaign, Inc. and Campaign to Stop Killer Coke. Ray Rogers, a noted advocate for labor and human rights, is President and Director of Corporate Campaign, Inc. and founder of the Campaign to Stop Killer Coke. Corporate Campaign was founded in 1981. Rogers pioneered the strategy of the Corporate Campaign that has been used with success by labor unions, human rights advocates and environmental groups in their battles against corporations. Time magazine said, “Rogers has brought some of the most powerful corporations to their knees and his ideas are spreading.” Boston Herald described Rogers as labor’s most innovative strategist and “one of the most successful union organizers since the CIO sit-down strikes of the 1930s.” Business Week described Rogers as a “legendary union activist.” Financial Times called Rogers “The Coca-Cola Company’s fiercest foe. The Campaign to Stop Killer Coke launched in 2003, is a worldwide movement with thousands of volunteers seeking to hold The Coca-Cola System, including the company and its bottlers, accountable for harmful practices that dangerously impact on the lives of workers, the environment and the health and well-being of children worldwide. For more information call 718 852-2808 or go to http://www.killercoke.org. RESOLVED, that the AFT communicate this resolution to Coca-Cola. Thomas, M. (2009). Belching Out the Devil: Global Adventures with Coca-Cola. New York, NY: Nation Books. Blanding, M. (2011). The Coke Machine: The Truth Behind the World’s Favorite Soft Drink. New York, NY: Penguin Group. Human Rights Watch. (June 2004). 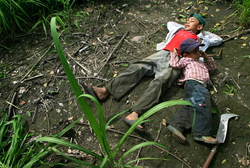 http://www.hrw.org/news/2004/06/09/el-salvador-child-labor-sugar-plantations (link is external). Gatehouse, M. and Reyes, A. (1987). Soft Drink, Hard Labour: Guatemalan Workers Take on Coca-Cola. London, UK: Latin America Bureau. ← Ucrania a punto de convertirse en una base militar de EE.UU.